Like most authors, I am often asked where I get my ideas for stories. I must confess I have led a life that often parallels that of Wile E. Coyote. All I have to do is close my eyes and bingo! I’m in trouble. Author Bumping has provided me with a good number of funny scenes in my comedy mysteries. Exactly what is AB? Bumping is a talent I come by naturally. I have literally fallen into a full body bump with some pretty big name writers. These unplanned slams usually occur with hilarious results. My first meeting with him was not the sophisticated event I would have preferred. I accidentally slammed into the poor man as if he were home base. All one hundred and twenty-five pounds of me hitting his chubby frame with an “umph!” But let me back up and get a running start into this story. A number of years ago I attended a writers’ workshop in London. We were a small group of dedicated hopefuls there to learn at the feet of PD James, Stephen King, and Bob Parker. The workshop took place at the London Polytechnic University campus located on Marylebone Road across from Madame Tussauds Wax Museum, and near White Chapel—home of Jack the Ripper. It was summer and the school was all but abandoned. Alighting from a cab, lugging my gear behind me, I gasped at the sight of the red graffiti scrawled over the tall grim buildings. I understand the school has since been renovated but at that time it was pretty eerie. I took a seat in the old lecture theater, laying my knapsack and duffle bag on the floor. I was pleased I had traveled light and finally got the hang of looking like a mystery writer. I had dropped the pink dresses and kitten heels after my last writers’ conference and now dressed in black slacks, matching top, and ballet flats. An administrator spoke from the stage telling the small assembly of mostly ladies how to find our room assignments in the dorms. She assured us that someone would be addressing our group shortly. I settled back and admired the carved wood paneling and Phantom of the Opera ambiance. “Sure.” But I needed a loo trip, too. Now was as good a time as any. The lady on Shirley’s far side agreed to stand sentry over our bags. My new friend and I set out in search of a potty. The halls were silent and resembled a mausoleum. The polished marble floors were slick underfoot and the lighting was dim. There were no attendants and no signs directing us to our much-needed ladies’ loo. “Maybe they’re on the second floor,” I said optimistically. We walked up a level. Nothing. And the lights grew dimmer. Shirley and I agreed to take this up one more floor. I was mentally kicking myself for not using the loo at the airport as I clung to the railing and hiked up the stairs. With the school unoccupied for the summer, someone had done a rather diligent job of polishing the marble floors. They were as slippery as ice. No potty. No loo. “One more floor?” I asked. Shirley nodded, her eyes like two giant robin’s eggs behind her thick glasses. It was awfully quiet. We made our way to the fourth floor clinging to the banister to steady ourselves. A good tinkle was now at the top of my list of most desirable things to do in London. On the fourth floor, we finally found a ladies loo. The harsh lighting cast the feel of the men’s room scene in The Shining. Jack Nicholson meets the long-dead manager of the Overlook Hotel. Okay… my nerves were a bit prickly. 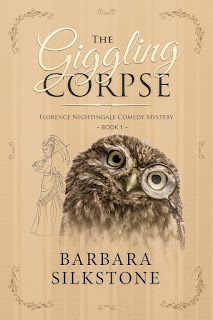 “Barbara! What’s going on?” my new friend whimpered. Silence. Not a word. No heavy breathing. Only the sound of Shirley sniveling from her position two stalls down. More silence. He was either waiting outside the door with a Jack the Ripper Knife or he had run away. We broke out of our stalls like two racehorses out for the Triple Crown. We hit the marble floor with Flintstone feet flying. Funny thing about running on slippery surfaces … you can build up some real speed. At the second level… Shirley went reeling. “Turn into the skid!” I yelled at her as I grabbed the railing. She squealed and then righted herself. By the time we hit the ground floor, we must have been going a hundred miles an hour. A group of people stood at the entrance to the auditorium. Robert B. Parker was among them. I lost control, went into a slide, and bumped hard into his portly belly. Slam! It wasn’t exactly how I envisioned our first meeting, but I have used versions of the incident in at least two of my stories. 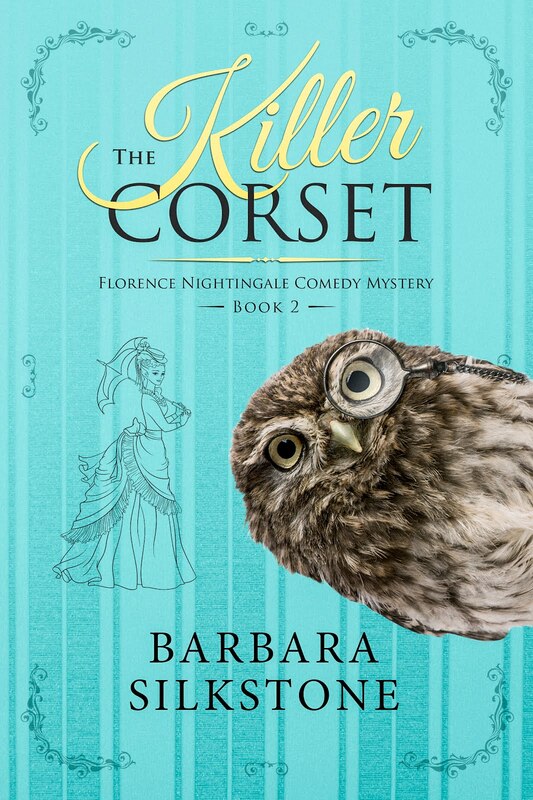 Join me as I start my latest series of tongue-in-cheek, fast-paced mysteries that see Poppy Throckmorten chronicle the adventures of the brilliant but eccentric sleuth, Miss Florence Nightingale. 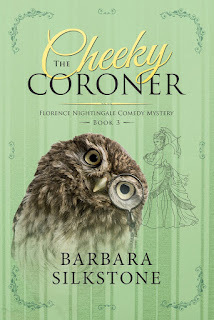 Today we have another nice batch of new mystery releases and newly discounted books to share on our MRM page at Amazon, including books from authors like Monica Knightley, Audrey Claire, Catherine Bruns, Ophelia London, Stella Bixby, Kathi Daley, Heather Graham, Wendy Byrne, Nicole Leiren, JT Ellison, Susan Y Tanner, Gin Jones, Sally Smith & Jean Steffens, Mary Birdie, CK Crigger, RosaLee Christie and many more! We are back today to start off May with a supersized update of our MRM page at Amazon, including new mystery releases, discounted ebooks, and featured pre-orders from authors like Wendy Lyn Watson, Tonya Kappes, Janet Finsilver, Sam Cheever, Peggy Webb, Ben Rehder, Kym Roberts, Amy Boyles, Christa Nardi, Jennifer Fischetto, Rebecca Cantrell & Sean Black, Miranda Sweet, Crissy Sharp, Sharon Pape, Auralee Wallace, Julie Moffett, Dianne Harman, Kathleen Bridge, Melinda Mullett, Krista Davis, Marty Wingate, Maggie King, JD Robb, Lee Child, Laura Durham, AR Winters and many more!